After a long flight and a late-night arrival to campus, Alice, Rodney, Janet, Sebastian, Sonsherée, and Judith of AXIS Dance Company introduced themselves to the Bates Community with a lecture/demonstration in which they performed and discussed short samplings of recent works. The company discussed rehearsal practices, educative initiatives, and what you do when you reach a limitation, like exhaustion, for instance—sometimes adrenaline gets you through, sometimes you need arnica the next day. Most audience members asked questions, though some affirmations slipped through. Omar Carrum, a choreographer with Delfos Danza and a teacher this year, stood up and poured his heart out to the company: he was frightened at first by this new and unknown form, but he was astounded by their effort and their beauty. We all agreed. The following day, we drove down to the Morrison Center in Scarborough, Maine for another lecture/demonstration. Over 100 audience members came from numerous agencies serving the disabled and as the performance began, one could hear shuffling feet and rolling wheels pouring around the corners of the space. Everyone wanted to see just what these movers were doing. Again, they performed tastings of larger works, this time incorporating the audience. To conclude the show, the members of AXIS improvised with audience members. Together, they moved like water, like popcorn, with slicing motions, high up and low down. This was very clearly the highlight of the show. 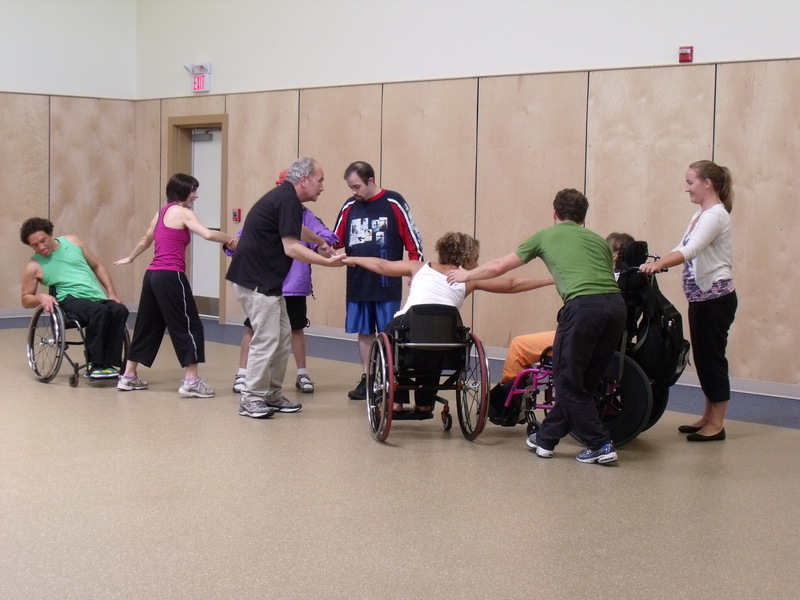 AXIS lead a physically integrated dance workshop at The Morrison Center in Scarborough, ME. After the show, kids hovered around Rodney asking questions and feeding off his exuberant energy. 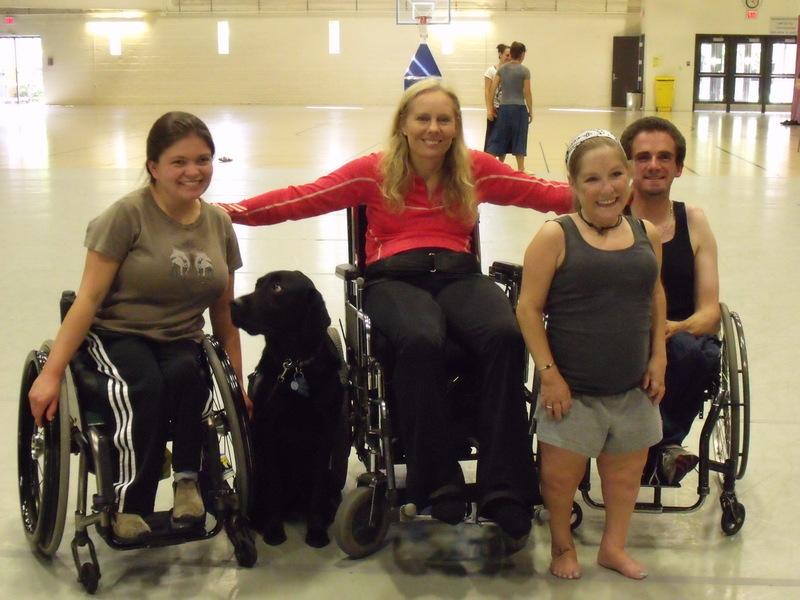 Physical therapists from the Morrison Center talked with members of the company about movement techniques: Sonsherée advised that instead of demanding mimicry, an instructor should suggest imagery. This allows for personal expression instead of specific stipulations. Alice also suggested establishing a movement language that everyone could attain, even if that’s only moving your eyes. The week progressed onward, with rehearsals galore and the occasional class. Most of the company members stopped in during the Contact Jam, and we all moved together, many jammers experimenting with the technology of a manual wheelchair for the first time. A few AXIS dancers dropped into festival classes, such as Cynthia Oliver’s class, Text and Movement, wherein they collaborated with students on phrase work and its deconstruction. On Saturday afternoon, the company held a workshop with local and festival participants. 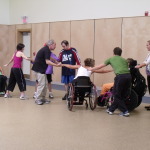 The class began with improvisational games: sculpting the body next to you, being led by the subtle force of touch, and locomoting in patterns. Then the class moved onto compositional tools. In pairs, we created phrases that had similar intentions to a duet demonstrated by Rodney and Sonsherée, however the outcomes varied tremendously. We spent the rest of class being blown away by our peers’ work. The company performed an impressive program of works on both Friday and Saturday night. The evening began with Joe Goode’s the beauty that was mine, through the middle, without stopping which toys with the authenticity of sight. Next up was Alex Ketley’s Vessel that opened with a duet to which Nancy Salmon, the Assistant Director, attested, “it was the sexiest thing I’ve seen in a while.” The show closed with a raw and sweet piece by Bates festival alum, David Dorfman, called Light Shelter. Dorfman described the choreographic process in the post-performance Q&A, stating, “in the beginning, rehearsals focused on establishing a common [movement] vocabulary in order to determine what we could risk.” It is because AXIS takes such risks, that they reach their audience’s hearts. And yet, they are not doing anything more extraordinary than being themselves. Talking with audience members after the show, the most common adjectives were “awe-inspiring,” “beautiful,” and “intense.” Ariana, a festival participant added to this list, asserting that “their collaboration of varied bodies was clever and full.” Two different dancers, Emily and Safi, both told me individually that AXIS’s work inspires new concepts of unison. The dancers in AXIS cause you to think, cause the humanity to pour out of you, simply by using the bodies they’ve got and moving them on stage.